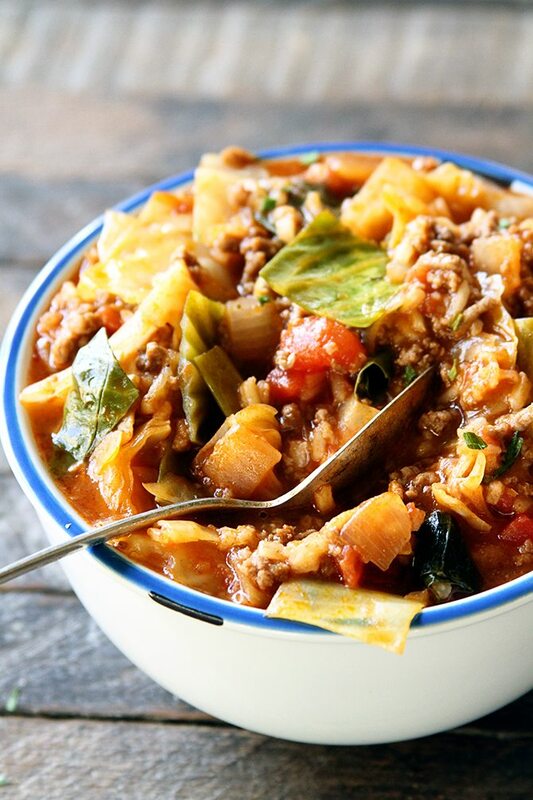 Stuffed cabbage is one of those foods that instantly takes me back to my childhood. One bite, and I am transported back to that blue-formica-topped kitchen counter watching Mom carefully roll the meat filling in the cabbage leaves. Oddly enough, even as a child, this was one of my favorite meals. It still is. But I wasn’t a normal kid. I’d turn down a bowl of ice cream for a bowl of collard greens – or so I’m told. 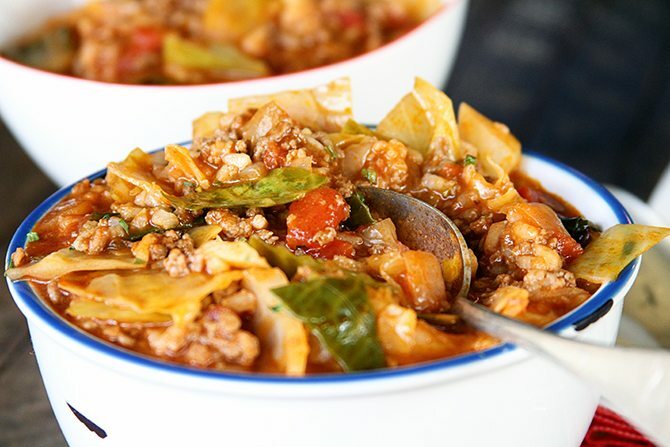 So when I started seeing tons of recipes for Stuffed Cabbage soup, I thought… “I need to do that to Mom’s recipe.” So I did! Not only is this amazingly delicious, but it’s SO much easier than the original. But it still has all the great flavor! It also warms up incredibly well. Lot’s of things like this often do. And this is no exception. In fact, I might actually prefer it the second day after all those flavors have time to get happy. I can’t wait for y’all to get a bite of this! A few things to keep in mind. 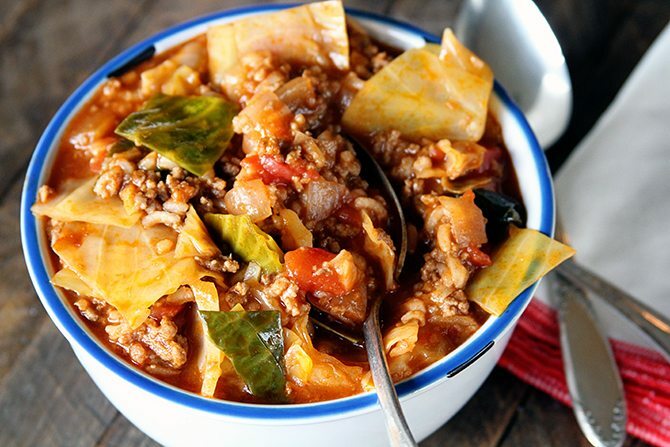 This recipe makes a thick soup – really more stew-like. So, if you want a thinner soup, just add some more vegetable juice. And while we’re talking about vegetable juice, let me clarify that the brand I use is V8. Does that help? Also, feel comfortable being generous with the salt on this one. It takes a lot to get it where it needs to be. I didn’t put a specific amount though because varying juices have various amounts of sodium and I didn’t want you to end up with something that was too salty. Don’t ever be afraid to taste your food. That’s what adding salt and pepper to taste means. Enjoy! In a large stock pot or very large dutch oven, brown the ground beef over medium-high heat. Once it starts to brown, add the chopped onion and cook until the beef is no longer pink. Drain the grease way. Return the meat and onion to the pot over medium heat. Stir in the garlic and cook about 1 minute. Add the undrained tomatoes, vegetable juice, and beef broth. Bring to a boil then stir in the rice. Reduce the heat to a simmer and add the cabbage. Stir well. Cook, covered, for 20 to 30 minutes, stirring occasionally, until the cabbage is tender and the rice is fully cooked. Generously add salt and pepper to taste. Add additional vegetable juice if you'd like a thinner soup. What a great way to sneak cabbage into your diet! Made this for dinner…really tasty! This is a keeper! Yummy! Awesome! So glad y’all enjoyed it, JoAnn!! Ha! So true! And it’s so good! I’ve been looking for a recipe like this for ages! A friend made this for me long ago and was never able to re-create it. Guess what we’re having for supper tomorrow??? LOL! Thanks Stacey, and as always your recipes rock! Thanks, Claudine! I hope you enjoy this and that it tastes just like what you remember! 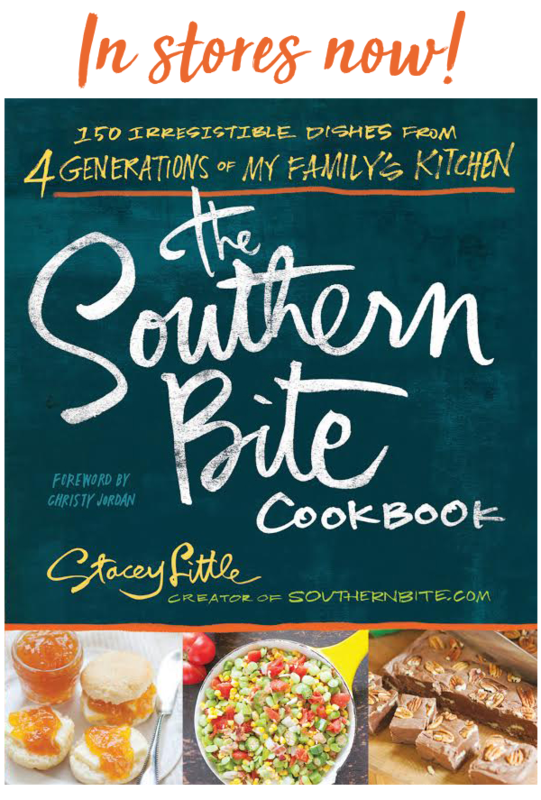 Thanks Stacey,i am going to make this.I have a recipe called cabbage wedge casserole,yet I have been reluctant to make it because of thinking the cabbage would absorb the grease.What do you think? That what’s great about this one, you drain all that grease away. 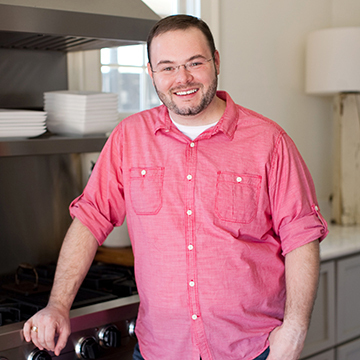 And using the leanest beef you can find will help even more. This will be another this weekend meal! Thank you! Btw! your Moms “Gravy and chicken recipe” was sooooooooooo good! Some people just don’t know what they missed! I hope ‘all will enjoy this one too! So glad to hear the Chicken and Gravy turned out well for you! Enjoy! I couldn’t agree more!! Yum! What type of cabbage did you use? I mix half a bottle of bloody Mary mix and half a bottle of V8. Either can be added to get the taste you want. Can you make this in a Crock Pot? It sounds wonderful. I don’t see why not. Simply brown your ground beef, then combine it all in the crock pot! Made this today! Love it! It’s actually like a stew, unless you add some extra beef stock and V-8 juice! Live it thick, so no problem for me. I also added a few extra seasonings, oregano and time…just my taste. You really can’t go wrong with anything! So glad you enjoyed it, Pam!! Made this it was really good! Love hearing that! So glad you enjoyed it, Elyse! Yum! I loved reading the part of your post where you talked about being a “strange kid” and preferring a bowl of collard greens to a bowl of ice cream. I laughed because as a kid I was the exact same way (and still am). To this day I prefer collards to ice cream. My mother, a chocoholic, does not understand my aversion to chocolate, lol. I’m going to have to try this, it sounds absolutely delicious! Have you tried freezing it? I’m wondering how it would do if frozen and then reheated for a second meal. Was wondering if you could sub brown rice instead? It looks so good! Absolutely! Just keep in mind it will require a longer cook time. Tried this, was good but turned out very thick, more like a stew than a soup. I would recommend adding the cabbage first, as the inner thicker parts of the cabbage were a bit under done when made according to recipe. 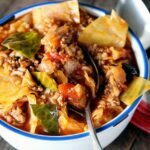 Overall great flavor, my wife adds a package of brown gravy mix to her stuffed cabbage as well, which I did add to this soup. 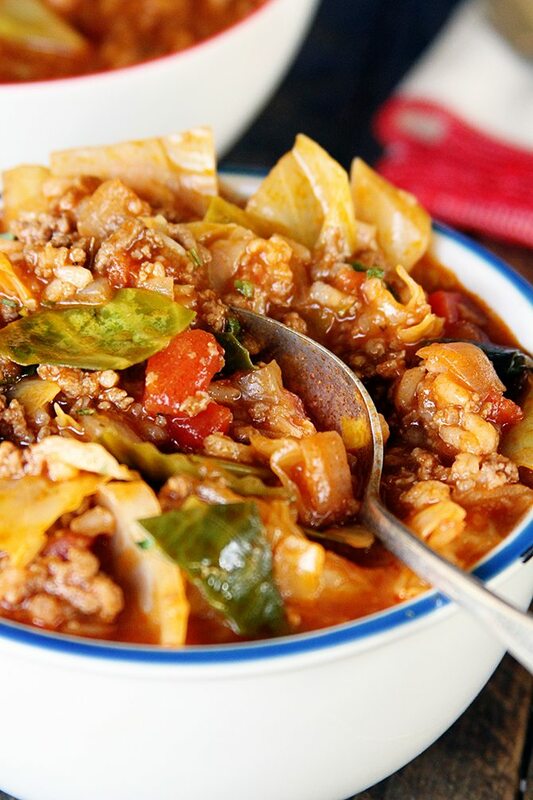 It adds another dimension of flavor that is closer to our family stuffed cabbage recipe. Overall well done, will make again and thank you! Good advice! I typically discard (or eat raw) the inner core. Love the addition of the gravy mix! I made this for dinner & it was amazing! LOL! Glad I could help out! Wrapping those things can be a booger! Holey moley! This is so good that I have even eaten it for Breakfast this morning. And lunch of course…and then dinner because it tasted so good the first two times. I must have needed some veggies in my diet! The V8 seems to add a lot of depth. I think I’m going to start adding to other recipes that call for tomatoes. 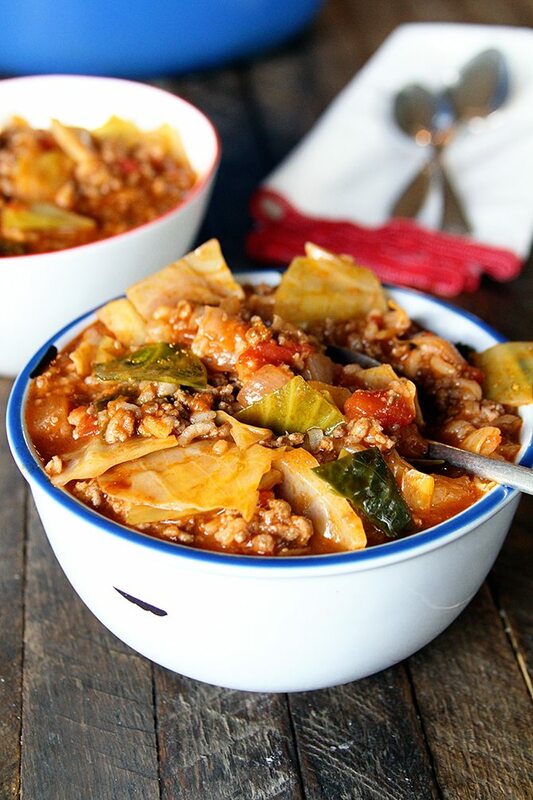 Thanks again for sharing this great variation on cabbage rolls! I’m so glad you enjoyed it! I really love adding V8 to recipes like this. It just gives them a kick! You can always add a little more liquid and cook longer if you have trouble. I’ve not had that issue with this one. However, minute or instant rice will also work.